Mukunda Gautam is Chief of Immunization at the Child Health Division in Nepal’s Department of Health Services. He analyses disease surveillance data and uses his findings to guide disease control activities, measure impact of immunisation programmes and support evidence-based child healthcare policy reforms. Mukunda is responsible for the effective implementation of the government’s National Immunization Program, which works to reduce child and maternal illness and death from diseases that can be prevented by vaccines. For this, Mukunda needs to know which geographic locations experience a high incidence of disease, which diseases are prevalent, what time of year disease outbreaks usually occur, and which groups are affected by the diseases. He needs detailed data to help him identify communities at risk of disease so that he can target the government’s immunisation interventions. To monitor the impact of the interventions he needs demographic data on the target population, data on vaccine coverage, and details of vaccine wastage. He also needs this data to help him to forecast annual vaccine needs throughout Nepal and make informed decisions about the vaccines’ allocation. The data that he needs is collected on a regular basis by the disease surveillance teams at the Child Health Division when visiting district health facilities. This data is recorded in the government’s Health Management Information System, which makes it accessible to a number of agencies in the government. Using data to measure the occurrence of disease: In the 2000s, rigorous campaigns were run in Nepal to reduce death from measles by 50% from the 1995 figure. By analysing data from the Health Management Information System, Mukunda and his team discovered that while the number of reported cases of measles had significantly reduced, there were rising instances of rubella, which increased from 227 reported cases in 2007 to 1,275 cases in 2009. Following their analysis the team quickly introduced a combined measles and rubella vaccine for every child in Nepal. 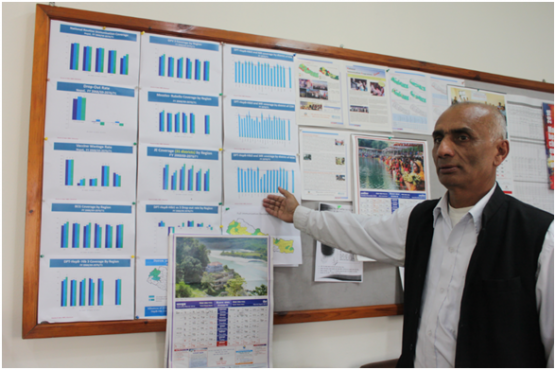 Using data to track immunization schedules: In two of Nepal’s districts – Palpa and Kanchanpur – an Electronic Immunization Registration System (EIRS) jointly developed by the Department of Health Services and the World Health Organization logs personal immunisation records. Since its implementation in 2015, almost 6,500 children have been registered in the system. Mukunda and his team have used this data to track which children need follow-up vaccinations and when. This has enabled them to send SMS reminders to the parents of the children to ensure they don’t miss a vaccination dose. Using data to measure the impact of immunisation programs: Mukunda analyses data on vaccine coverage to determine whether the immunisation programmes have achieved full or partial immunisation. His findings help him to measure the impact of those programmes and guide his decision on whether the campaigns to encourage vaccinations, run by volunteers on local radio and television, need to be increased. The temporary migration of families from hills to the Terai plains during winter alongside unexpected movements of people around the country has been a major challenge for Mukunda and his team when making estimates for immunisation needs. The lack of comprehensive recording of births at the village level has posed a barrier for Mukunda and his team. The exact population may be much larger than the projected population because many births are not registered. This means that, at times, the data on the size of the target population detailed in the Health Management Information System does not match the population size at the actual time of vaccination. In the past this has led to incorrect estimations of the number of vaccines and healthcare providers needed, and the size of the budget needed to organise a vaccination session. But most importantly this has presented a challenge to the goal of immunising every child and protecting them against preventable diseases. The manual entry and tabulation of data by officials at the district level and below is another problem for Mukunda and his team. District officials need to be trained in computer and data management to be able to use the Health Management Information System and for there to be consistency in data reporting from across the districts. This can lead to delays in the collection and transmission of the data needed for Mukunda’s analysis.